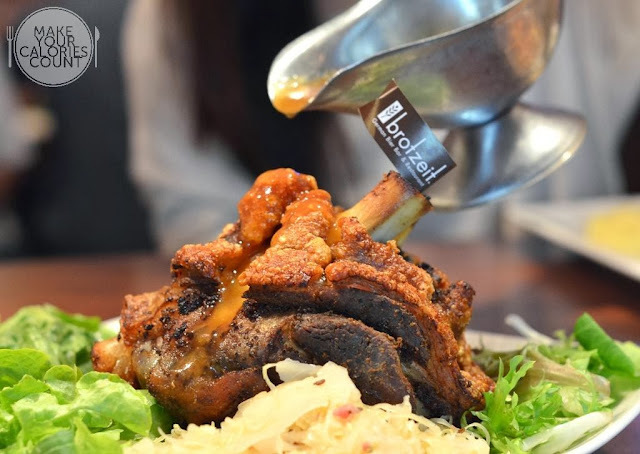 [SG] Brotzeit - Singapore's gateway to Oktoberfest! Oktoberfest is the world's largest fair held annually in Munich, Bavaria, Germany. A 16-day festival which runs from late September to the first weekend in October, it is estimated that 6 million people attend the event yearly and celebrations include the excessive consumption of beer, Hendl (chicken), Schweinebraten (roast pork), Schweinshaxe (grilled ham hock), Wurstl (sausages) and Brezen (pretzel). So...how did the event come about? It was said that Crown Prince Ludwig, which later became King Ludwig I was married to Princess Therese of Saxe-Hildburghausen on 12 October 1810. The joyous royal event was therefore marked for celebrations even till today but the festivities were advanced to September to allow for celebrations in better weather conditions. 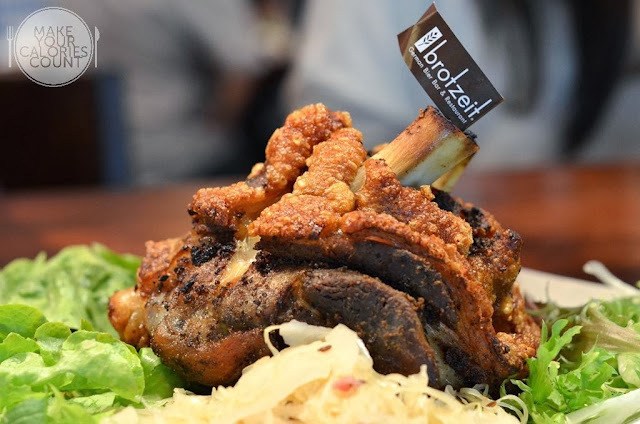 While we searched for the best Oktoberfest parties in Singapore, we settled for Brotzeit which had over the years developed to be brand where common folks like us could easily associate with German cuisine and the bier (beer) of course. 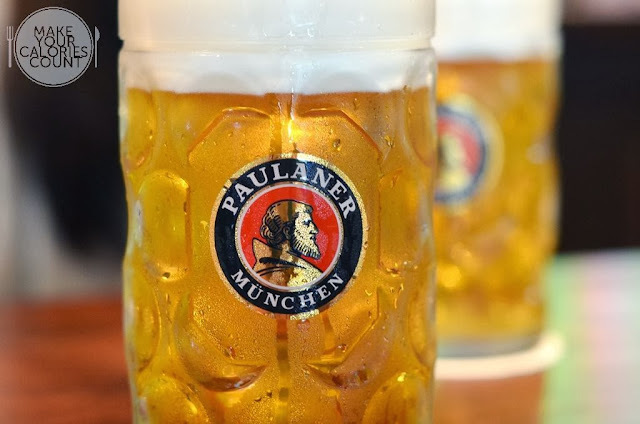 Serving freshly brewed draught beer from Paulaner, it is no wonder this F&B chain had been so successful since its inception to the local scene in 2006 with regional footprints in Malaysia, Vietnam, Hong Kong, China (Shanghai and Shenzhen), Philippines and Thailand. 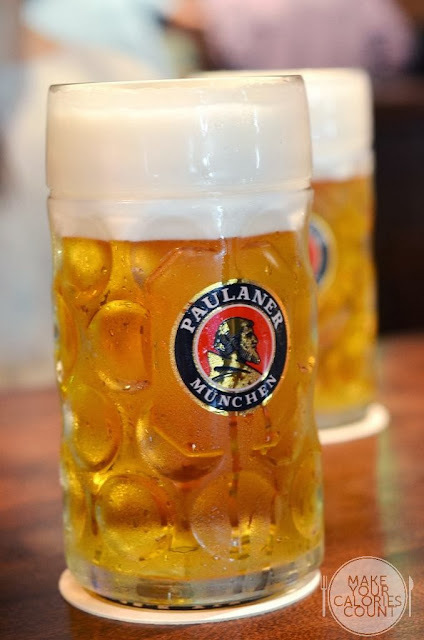 Let us start the evening to a toast with our 1-litre tall mugs! Prost! 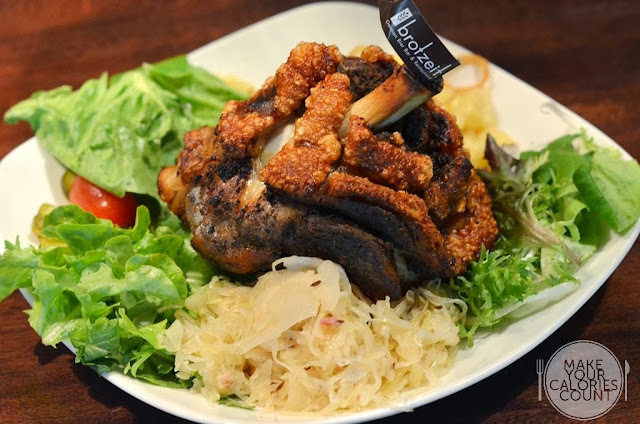 We were largely tempted to go for the Oktoberfest platter which came to S$168++ for a feast fit for a King! Designed for party-goers of 4 - 6 pax, we had to give it a miss due to the sheer amount of food served, such as ribs, pork knuckle, grilled sausages, etc. Considered lightweight by the standards of the Germans, we went for individual portions of our preferred choices! With limited portions served each day, there was surely no missing this crispy hind shank of grain fed pork served with potato salad, sauerkraut and homemade sauce on the side. There was simply nothing to fault about this pork knuckle with its tender soft meat on the inside complemented by the crispy skin coating it. Expect to hear the crackling as we gorged ourselves silly with the pork and the beer! 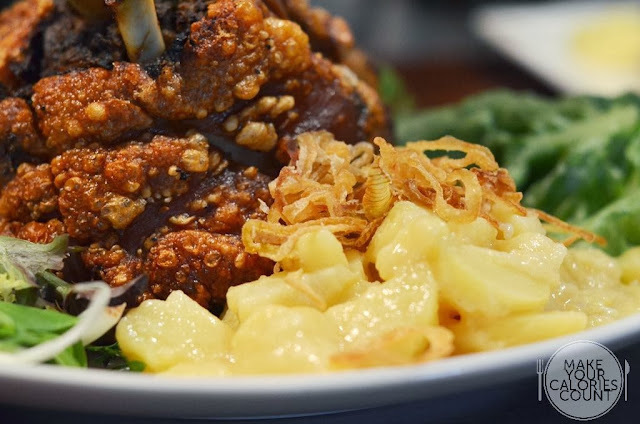 While the homemade sauce was supposed to enhance the flavours of the pork knuckle, we felt that it was rather pedestrian and nothing too impressive. The viscous brown sauce enriched the juiciness of the meat underneath that crispy skin but standalone, the flavours were rather muted and dull. The ladies loved the potato salad! The potatoes were cut to bite-sized portions and generously coated with its own house dressing which was based on mayonnaise and similar to the US counterpart rather than the classic 'Kartoffelsalat', which is a popular variation prepared with vinegar and oil. There was a good balance of sweetness and just a touch of tang in the dressing which made it surprisingly addictive! 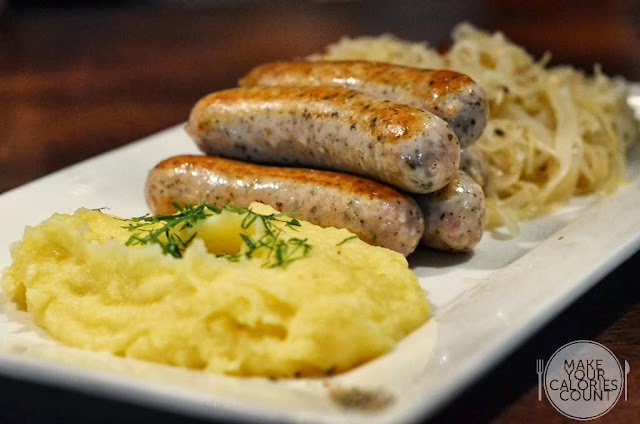 A German meal can never be complete without sausages so these pork bratwurst sausages were a must-try. It was served with mashed potatoes and sauerkraut but the highlight was none other than the savoury sausages oozing with juices as one takes the first bite. 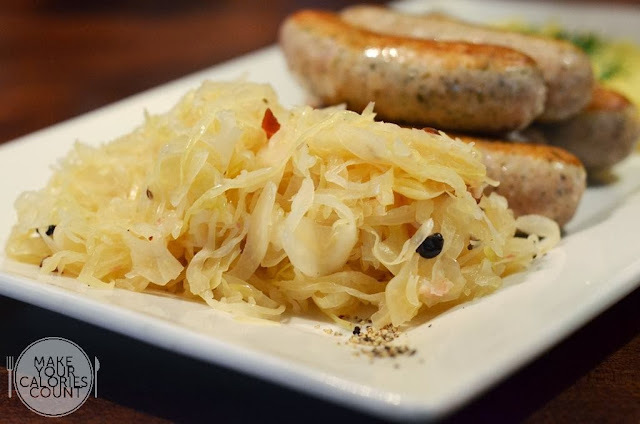 The sauerkraut translates to sour cabbage, which is essentially finely cut cabbage that has been fermented by various lactic acid bacteria. Apart from having a long shelf-life, it has a distinctive sour flavour which is a result of the lactic acid that forms when the bacteria ferment the sugars in the cabbage. Did that gross you out yet? If not, then stay with me - because this was surprisingly good and helps neutralize the flavours and tastes from the sausages and the pork knuckle. While it could not be regarded as a healthier side dish, it enhanced the sausages and pork knuckle and I soon found myself drawing the last strings of the finely cut cabbage! The mashed potato was impeccably smooth and had a rich creaminess to it that the ladies could not resist and had to order a separate serving to satisfy their craving. 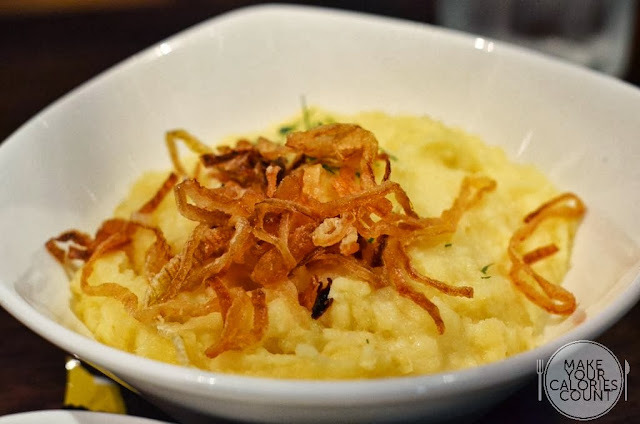 Served with finely sliced, deep fried shallots, it added an additional layer of crispy texture to the fine mash. Served on a squarish plate, every inch of this looked just like a normal pizza and we unanimously concluded that we ordered a bacon pizza. While it sounded boring and nothing too fanciful, it was pleasant to the palate and definitely went very well with the beer. Some might find the chilli a touch too spicy but hey, that is what the beer is for! 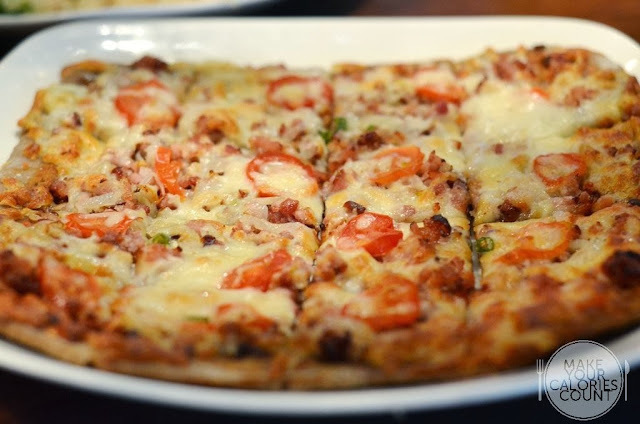 Generous amounts of mozzarella cheese, bacon, onions, vine ripened tomatoes and tomato sauce, this bacon pizza was well received. We especially loved the rye bread base that was considerably thick of about 3mm which I felt gave enough 'dough' to each bite. We managed to be seated by 8pm and the draught beers were considerably cheaper where the 1-litre came at S$21/++. It would have been S$26.5/++ after 8pm, which make a considerable amount of savings! We had the Hefe - Weissbier, which is the typical beer from Munich; top fermented, unfiltered and made with wheat malt. It is naturally cloudy with vitamins and hints of banana. While there was the usual manly bitter after taste in the beer and especially German lager, it was smooth and suited even the ladies. My only complaint was that while it was naturally frothy, the beer came rather short of its full 1-litre serving. It was cash on delivery for the drinks and meals, so have your cash or cards handy to pick the tab as soon as the orders were served. The ladies serving our table were friendly and approachable though the loud music and partying in the background made talking quite a chore and at times we were shouting our orders across! Good beer, gorgeous food, lovely ambiance and great customer service, it certainly left us trio impressed! Looking forward to the next German meal already!